Do you have a sensitive cat? 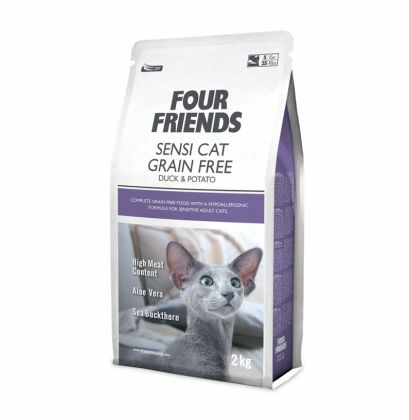 Sensi cat Duck & Potato is a grain free cat food with potato as the only carbohydrate source. The protein source is pure duck meat. 90% of the total protein comes from animal origin. We have also added sea buckthorn extract. The berries of sea buckthorn are packed with antioxidants and has a positive effect on the urinary tract. Starting at only £4.00 for a 300g bag, a 2kg bag costs £14.75, a 6kg bag is £34.98 and a bundle of two 6kg bags is only £54.99. FourFriends Sensi Cat gives excellent value. Remember you earn Loyalty Points on each purchase. Composition: Duck Meat Meal 43%, potatoes, chicken fat (preserved with mixed Tocopherols), poultry protein hydrolyzed, potato protein, dried apples, brewers yeast, hydrolyzed poultry livers, salmon oil, aloe vera (5g/kg), mannan-oligosaccharides (125mg/kg), fructo-oligosaccharides (125mg/kg), yucca schidigera extract (75mg/kg), sea buckthorn extract (50mg/kg).